The Southern African Development Community – SADC – has endorsed and released a Regional Strategy on HIV Prevention Treatment and Care and Sexual and Reproductive Health and Rights for Key Populations. The strategy is a result of a series of participatory and interactive processes that involved members of key populations, governments, civil society and development partners. It is expected to serve as a guide to Member States in designing and implementing appropriate Sexual and Reproductive Health (SRH) and HIV prevention, treatment and care programmes for key populations focusing on the major issues that need to be addressed at policy, legal, institutional and facility levels. Pre-exposure prophylaxis (PrEP) was conceived to fill the urgent need for a woman-controlled HIV prevention method. However, biomedical technology alone will not alter the underlying gender inequalities that make women and girls vulnerable to HIV. 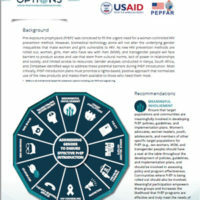 This technical brief was developed by Michele Lanham from FHI360 – an OPTIONS consortium partner. It focuses on addressing gender while ensuring effective PrEP introduction. Last September, the United Nations General Assembly adopted the Sustainable Development Goals (SDGs) – 17 goals, with ambitious targets, to drive a new global sustainable development agenda for the next 15 years. Research into the shortcomings of the predecessor Millennium Development Goals (MDGs) recommends that coordinated, formal civil society engagement in policy and implementation will be critical to the achievement of any new development targets. 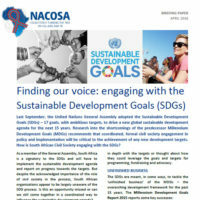 How is South African Civil Society engaging with the SDGs?